The huge display takes up much of the body, but it will still squeeze in a jeans pocket. Earlier on this year, we were all surprised when the Xperia Arc did so well – we’d all been expecting the Xperia Play (with its Playstation overtones) to be the big success, but it was the Xperia Arc that ruled the roost. Now, Sony Ericsson has brought out its predecessor, with a slightly speedier 1.4GHz chip. But what else has Sony Ericsson managed to add to this handset in just a few months? Well, the major change is that new processor – and if you’re used to smarties with a dual-core this won’t impress you as it’s only a single–core. So it’s not going to be as futureproof as the likes of the Motorola Atrix, HTC Sensation and Samsung Galaxy S.
However, in practice, the Arc performs really well, so you won’t miss that dual-core tag. Streaming videos was smooth and it was fine when playing games, so we don’t think you have any reason to worry about the chip. It appears that the Xperia Arc S can cope with just about any task you ask it to carry out. At the end of the day, there is not really as much difference between single and dual-core chips as the publicity machines would have you believe. So if you’re still bothered by the fact that it doesn’t have a dual-core processor at its heart, be assured that any doubts will be negated when you witness the speedy loading times, smooth interface and generally good performance of the Arc S.
All well and good, but the real standout feature is the fantastic Reality Display. This 4.2 inch LED backlit display, which boasts a resolution of 854x480, runs on the BRAVIA engine that Sony uses in its high-def TVs, so unsurprisingly it offers a fantastic viewing experience, whether you’re playing games or watching video clips. The touchscreen is really responsive and there is so much space that it makes typing a breeze. Surfing the net is also a joy thanks to the web pages benefiting from lots of detail and really clear, crisp text. You’ll find the usual Android buttons for home, menu and back right at the bottom of the handset under the screen. The rest of the handset looks pretty much like the original Arc – after all, if it ain't broke why fix it? Despite having some big features, the way the phone is designed they seem quite dainty. For instance, even though it has a massive 4.2inch display, the chassis is only 8.7mm thick and has a concave reverse, so the whole thing doesn’t feel oversized. It’s light at just 117g and will squeeze in a jeans pocket with ease. The only downside is that it is light because it has a plastic case, and that may be displeasing to some users and feel rather cheap. You’ll find the 3.5mm audio jack on the top left and the USB port and volume rocker on the top right. The dedicated camera button is lower down. Speaking of which, the snapper is the best we have ever seen on a phone. The original Arc had already gained plaudits for its image-taking capabilities, and the Arc S goes one step further. As well as a massive 8.1 megapixels, this model also boasts the ability to take 3D panoramic images. Take an image while sweeping the camera around your view and you’ll produce a 3D image that can be exported to be viewed on a 3D TV. Which is great if you actually happen to own a 3D TV. We also found the whole thing quite hard to carry out. What you’re supposed to do is hold down the camera button until the 3D icon appears and then pan from left to right to take your picture. Unless we’re missing something really obvious, this wasn’t as easy as it sounds and it took us several goes to get any success. It proved rather infuriating, and is pretty useless if you don’t have a 3D device to view it on. In contrast, shooting 2D images was great – pictures came out colourful, sharp and with a pretty speedy shutter speed. We’d have liked to see a front-facing camera too, but maybe we’re just being a bit too picky. The Arc S runs Android’s latest flavour –Ginger 2.3.4. Anyone familiar with the OS will know that it offers a vast amount of customisability, along with five homescreens that can be tweaked with your choice of apps, shortcuts and widgets. 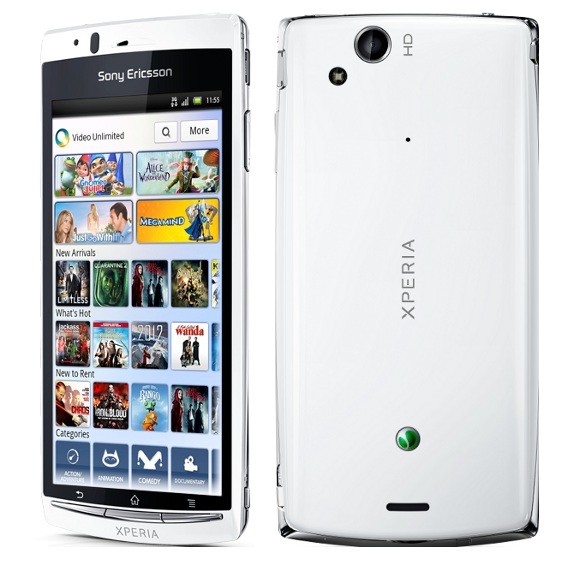 Sony Ericsson has added its distinct personality to the OS with its own interface. It’s simple to find your way around and along with the three hard keys, you can use five fixed panels on the display to help you find your way to messaging, media, apps grid, phone and contacts book. Timescape is the main feature on the default home screen. This pulls together all your recent calls, emails and messages as well as Twitter and Facebook activity. They come together in one stream, which is shown as a pack of cards. Timescape is actually not quite as smooth and stylish as it might like to think – we found it took a while to refresh and didn’t add much to our whole social networking experience. There’s no denying that the Sony Ericsson Xperia Arc S is a good-looking smartphone that has a fantastic screen that is up there with the best on offer from Samsung and Apple. We’re just not sure why Sony Ericsson felt the need to rush out an upgrade to its hugely successful Arc so quickly. It doesn’t really offer much in the way of incentives for existing owners to upgrade, but if you didn’t buy an Arc when it was launched but really liked the look of the original, this model, with its fantastic screen is certainly worth a punt.